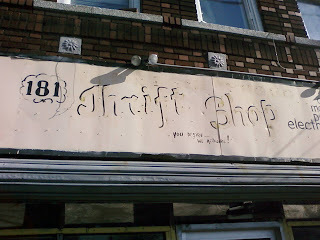 This thrift store at 181 Hegeman Street in Brownsville caught my eye with their hand-painted sign (gotta love 'em!) and their snappy rhyming slogan. It begs the question, however, of where and how they get their merchandise, as most thrift stores aren't in a position to "acquire" on demand. Regardless, it's a great sign (zoom in on the second image for a better view of the slogan, painted between and underneath "Thrift Shop"). 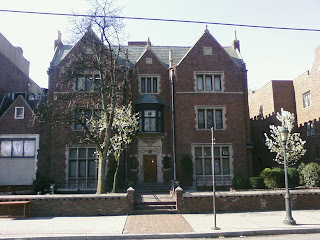 A bike ride along Eastern Parkway furnished me with shots of three of the most impressive structures in Crown Heights. The first two pictured are a pair of once-mighty single-screen movie palaces that have escaped demolition and received a new lease on life as churches. 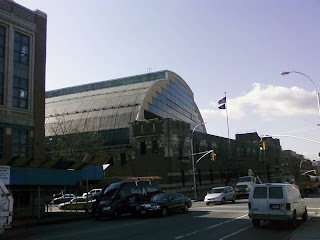 The final photo is of an enormous armory that now does double duty as an indoor location for NYC's film and TV industry. 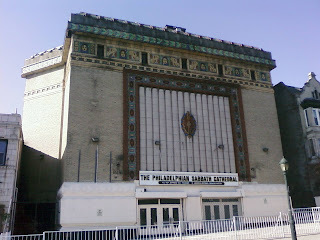 The Philadelphia Sabbath Cathedral (second photo), with a recognizably ornate movie-palace facade, opened as the Cameo Theater in 1924, and was later owned by the Loew's and Brandt chains. A friend who grew up in Crown Heights remembers spending entire afternoons watching karate flicks in the 1970s in one of the theater's 1,486 seats just before it closed for good. In its pre-air-conditioning heyday, the theater would sit even more (1,500) on the roof for summer screenings. There's a great shot of the interior as it looks today here. 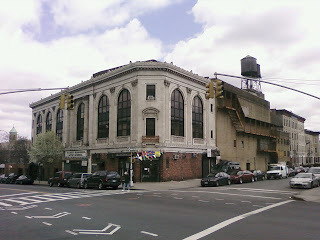 However, the Cameo was only the largest theater in Crown Heights for two years, until the Fox Savoy Theater on Bedford opened in 1926 (first photo). Seating twice as many, the Thomas-Lamb-designed, 3,000 seat giant was the largest theater in Brooklyn and the flagship of the Fox chain until their downtown theater opened. It too hung on as a theater through the 1960s before being closed and reborn as a church. According to Cinema Treaures, the interior remains largely intact today, with the original stage curtains still hanging. 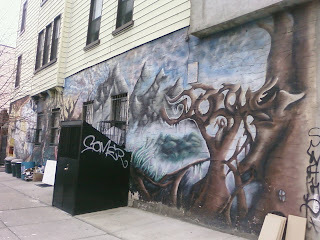 Movies might not show in the biggest buildings in Crown Heights anymore, but they're still made there. The National Guard Armory at Bedford and Union still serves its original function on a part-time basis, but it also provides a unique indoor space for building massive sets for film and television production. 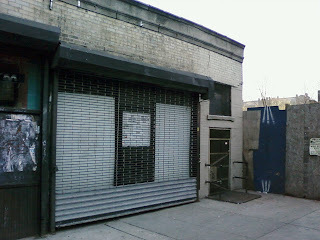 The same friend who grew up watching Bruce Lee at the Cameo (or Kameo, as it was later known) has worked on films in the Armory for which whole brownstone facades were built. In the past week, The Sorcerer's Apprentice, due out in 2010 ad starring Nic Cage, has been shooting there. Many thanks to Cinema Treasures for their research--I first discovered their great site while trolling for information in one of my earliest posts. For more information about the remaining movie palaces in Brooklyn, check out this photoset on flickr, which seems to suggest that occasional walking tours are held for interested parties. 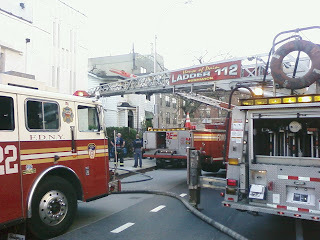 A three-alarm fire stopped traffic on Franklin Avenue between Greene and Gates Avenues this afternoon, but appeared to be under control by 6:30 PM when the first three photos above were taken. The fire gutted a detached wood-frame house (last two photos) at approximately 378 Franklin Avenue, just south of Quincy, but did not seem to have spread to surrounding structures. A local woman who had spoken with a firefighter said the house had been vacant for some time and that no one was hurt in the blaze. The third alarm was rung, according to her source, because of a faulty fire hydrant on the north side of Quincy that left firefighters short of water. A small crowd had gathered by the time I arrived on my bike, but the mood was calm. 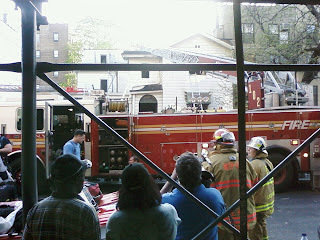 One woman approached the firefighters to say "You're doing a great job. Thank you so much." 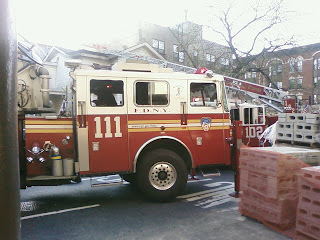 When she returned to the curb, she remarked, "After 9/11, I just get chills thinking about what they do. We sometimes think differently about the cops, but these guys are stepping into an inferno." 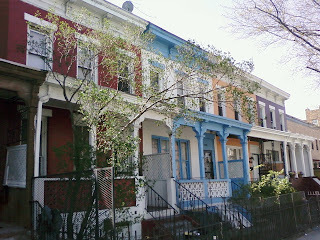 I don't have a single historical tidbit to offer about these gorgeous rowhouses on Lafayette at Patchen in Bed-Stuy, but they brought me joy sitting there in the sun with their perfectly manicured little porches. Here's to the great spring weather! If you're a Franklin Avenue resident, consider this activity for Sunday. The Crow Hill Community Association is hosting a Spring Cleaning and Planting Day on Franklin from 10:o0 AM - 12:30 PM. If you're game, bring a bag for trash, a plant (the Grand Army Plaza Farmers' Market has them for sale now, so pick one up on Saturday), and some rubber gloves to the 2-3-4-5 Franklin Avenue stop on Eastern Parkway at 10:30. 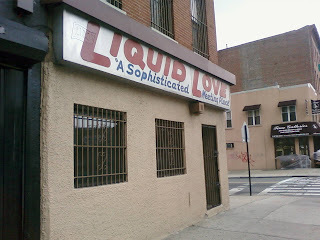 The party will work its way north to Bergen street over the course of a few hours (no word on whether it will finish with drinks at Siempre Amigos). Many thanks in advance to everyone who participates! There's a copy of the Empire State Building in Vegas and another Statue of Liberty in Paris, but 770 Eastern Parkway, the home of the Chabad Lubavitch World Headquarters in Brooklyn, tops them all. As captured and depicted in this work by artists Andrea Robbins and Max Becher, the 19th century gothic-brick house has been remade in 12 cities on five continents, with plans underway for the 13th and 14th. 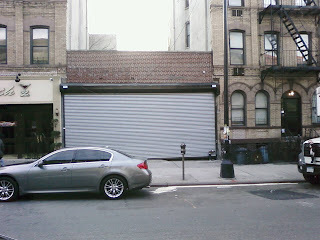 I received a comment about this back in November, but I hadn't passed the site with a camera until early this morning. 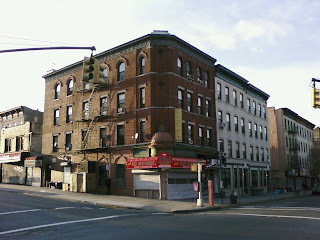 The house was purchased by the Chabad Lubavitch movement in 1940 for the sixth Rebbe, Yoseph Yitzchak Schneerson, who had come to Brooklyn fleeing Nazisim (the Wikipedia page claims that the previous tenants were shut down for performing illegal abortions, but I couldn't verify this). 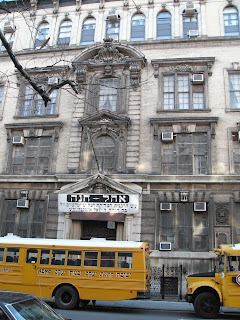 It became the a center of Lubavitcher life in the 1950s under the seventh Rebbe, Menachem Mendel Schneerson, and began to be replicated worldwide as part of the Chabad House movement. For an interesting look at the religious history of Chabad Lubavitch Judaism and its place in Jewish Orthodoxy, click here. 770 even has its own blog (what could be a better indicator of status than that!). St. Teresa of Avila, the substantial parish church at Sterling and Classon, is older than I thought. The parish was established in 1874, and the sanctuary itself dates from the same year (great old postcard here). 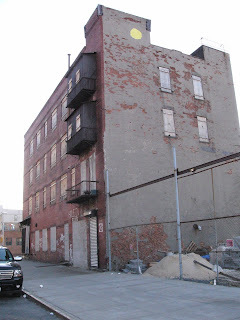 Today, the building blends fairly seamlessly into the rest of the neighborhood, but it must have been visible for miles when it was built, an era when Charles Lewis Fussell was painting images of the neighborhood like this one and this one. 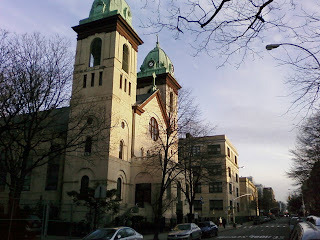 What little history I could find of 19th century Crown Heights suggests that development kicked off in the 1880s (though I'm sure there's more to the story), so perhaps the establishment of this sturdy church was a harbinger of urbanization for the area. Today, St. Teresa's offers Sunday Mass in three languages (English, Spanish, and Creole). 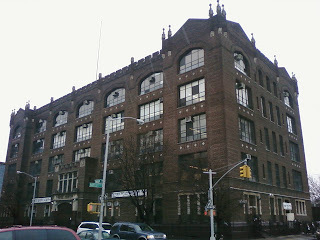 The school across the street was originally St. Teresa's High, but that school closed in 2002 and was replaced by Brooklyn Jesuit Prep, a middle school. As for St. Teresa herself, she was a 16th century Spanish nun. The borough's trees are budding and blooming, adding a joyful touch of spring to quiet streets and busy avenues alike, and capturing the gaze of many a photographer and blogger in the process. Out in Crown Heights, Eastern Parkway is slowly turning green while the flowering trees on Franklin, Bedford, and other avenues have taken on the resplendent look of white and pink cotton candy in the last week. 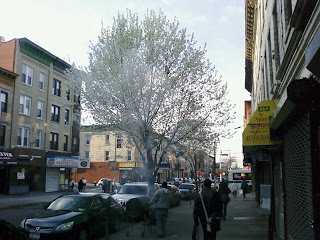 Pictured above is a flowering dogwood, thriving despite the steady stream of fragrant smoke from the jerk chicken grills of The Spice is Right on Franklin. Me: Yeah--do you know what kind of trees they are? Neighbor: No, but they look great when I'm on mushrooms. Me: Well, I'll google that and see what comes up. The trees we were enjoying are some of New York City's most valuable and productive residents. No matter your business or issue, trees along the street are a good thing: they increase property values, they reduce pollution, they collect rainwater and help prevent combined sewer overflows, they block wind, absorb sunlight, and create shade, all of which reduces heating and cooling costs, and they do it all while making the built environment a tolerable and sometimes beautiful place to live. The Parks Department, which manages the city's street trees, counted nearly 600,000 in NYC in 2005-2006, and they have an ambitious plan to add a million more trees to the city (including parks and private lands) in the next decade. The mayor and council are backing them, passing legislation last year that requires the planting of street trees at all new developments. As a New York City resident, you can request that the parks department plant a tree for you, or you can plant one yourself (more information here). If you're feeling particularly motivated, Trees New York will teach you to care for the trees in your neighborhood. They've certified over 11,000 residents since their founding in 1976, and the work they do is crucial--healthy, happy trees make for a healthier, happier city. UPDATE (4/17): If you're a motivated Brooklyn resident with a yard, Million Trees NYC is offering a coupon for 20% off trees grown and planted in NYC. Thanks to Team Tish for the heads-up. 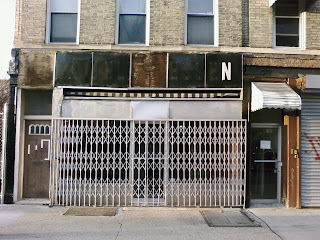 Tony Fisher, the neighborhood-minded owner of Fisher's Supermarket on Lincoln and Franklin, announced about a month ago that he'll be opening a new coffee shop in at 809 Franklin, the storefront adjacent to his current shop, this summer. The market will also be getting an overhaul to provide better service to what Fisher calls "the ever-changing neighborhood." 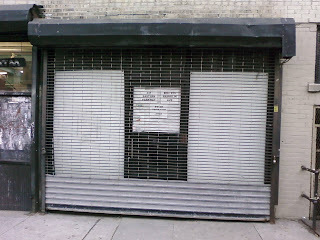 Mazon's discount store, which had previously used the storefront to oversee their development (currently on hold) on the Eastern Parkway corner, will be relocating to the shop next to 95 South (last photo above). For a great photo of the ever-changing neighborhood circa 1910, click here. The photographer is looking north down Franklin from Eastern Parkway, and in terms of structures, the street hasn't changed too much, though the trolley tracks are no more. Fisher's currently occupies the building on the far right (thanks to poster ATRollin for the image). In the latest piece of news that the good people at the Observer file under "Crown Heights Gentrification Watch," a new skate shop/flower shop has opened on at 533 Park Place (on Classon Avenue), a short hop from new nightspot Washington Commons and on the same physical block as Chevella's and Pluto Gallery. 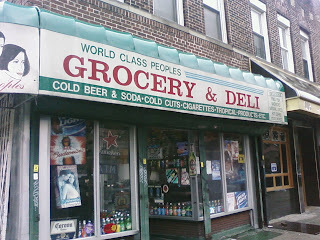 Park Delicatessen, the opening of which was announced two weeks ago on Brooklynian's Crown Heights Forum by owner Michael Sciafani, retains the name of the previous tenant's business but operates as a full-service skate shop, as well as selling locally-grown flowers and antiques/vintage home and garden supplies. Hours are Wed-Sat 11-6:30 and Sun 12-5. As something of a kickoff, the shop will be hosting a "Skate Jam" on Saturday, May 16th across the street in the PS 316/MS 353 schoolyard. You can debate the border of the neighborhoods all you want, but there's no denying that Prospect Heights/Crown Heights/Crow Hill is something of a hot spot for new retailers, recession be damned. 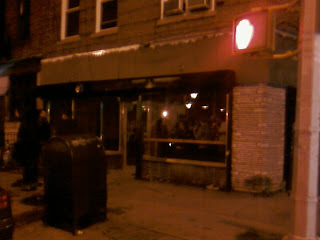 With the opening of Manhattans this weekend, St. Johns Place now sports the best bar crawl where you can actually get a table in Brooklyn, running east from Bar Sepia (at Underhill) to Manhattans (at Washington) to Abigail (at Classon, and offering a spectacular 4-8 happy hour of $3 beer and $4 wine) to Franklin Park (almost to Franklin, and their usual spectacular selves). You could take a similar walk along Park Place two blocks to the north if you stopped for a drink at Washington Commons, Chevella's, and Homage. 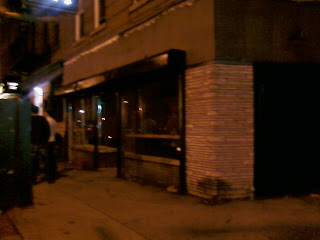 At this rate, it won't be long until the old Nassau Brewery at Franklin and Dean re-opens as a brewpub. Signs, signs, signs . 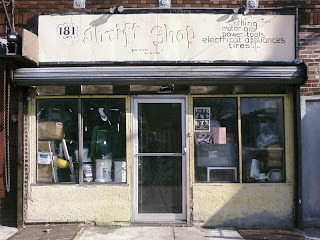 . . Brooklyn may be the borough of homes and churches, but its creative storefronts have earned their place in the look and feel of the neighborhoods, becoming objects of affection for residents and occasionally stirring up some citywide controversy. 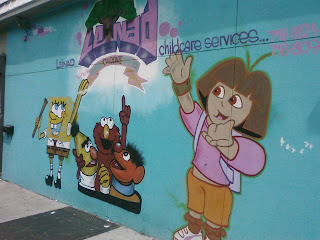 This piece of handiwork at the corner of Franklin and St. Marks always brings me a little joy when I'm headed up the avenue to the 4 train. 136 Years Old This Week! I walk up Bedford Ave at least once a week, but I'm usually late for work when I do, so taking photos is out of the question. 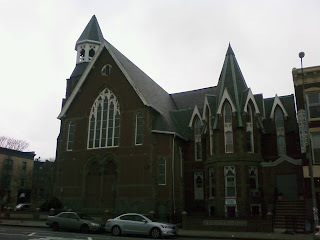 Today found me walking south along the avenue with time to spare, so I grabbed some grainy shots (better photos on a nicer day here) of what is now the Iglesia Cristiana de Nazereno on Bedford and Madison, and took them home to do a little research on what is clearly an old church. I'd have guessed the sanctuary was built in the 1920s if I'd been pressed, but I'd have been off by 50 years. 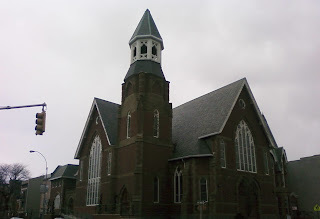 As reported in none other than the Grey Lady, the East Reformed Church opened on Sunday, April 6, 1873, with its 1,1,00 seats packed full and hundreds more standing. The Times commended the design, which they said presented "a rich appearance, without being gaudy," for its excellent acoustics, elegant stained-glass windows, and powerful organ. This final feature, whose mighty lungs were filled by a water-powered bellows in the basement, was built in 1869 by New York City organ-maker Geo. Jardine & Son (their work pops up all over the city and suburbs), and according to the NYC Organ Project, remains in the church today. Perhaps the water-powered bellows lend the current congregation their full title, "Fuente de Agua Viva Iglesia Cristiana de Nazareno). 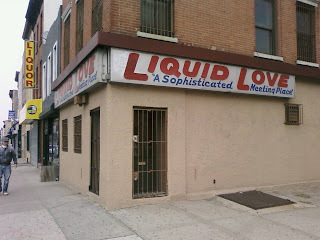 And of course, no blog-walk up Bedford would be complete without a couple of snaps of Larry's Liquid Love, which held the title of "most blogged sign in Brooklyn" until Obama Fried Chicken came along. Be careful if you break in . . .
Harrison and Rutledge - Score one for truth in advertising. The question is whether this message is the work of the owners/management in an effort to keep potential squatters out, or the work of one such invader notifying kindred souls. The building looked pretty impenetrable from the street, but perhaps there are places to breach the cinder block somewhere around the back. New York City (and before 1898, the city of Brooklyn) built a series of grand, gargantuan buildings to house public schools around the turn of the last century, many of them designed by world-class architects. In the low-rise residential neighborhoods of Brooklyn, these schools--four or five big stories high--tower over the brownstones as monuments to public education, lending a grandeur to their purpose that the more functionalist schools built in the decades since can't really match. Still, it turns out that these giants weren't always the most efficient or beloved structures to the Board of Ed, who, over the years, abandoned or sold off some of the biggest old schools.. 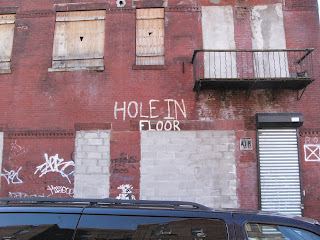 The original schools, however, have found alternate uses around Brooklyn. Forest City Ratner converted the gorgeous P.S. 9, which the NYTimes called "one of the most controversial buildings" in Prospect Heights, into apartments in 1990, sparking local outcry by displacing of the Prospect Heights Neighborhood Corporation (Bruce Ratner and Prospect Heights are now on great terms). 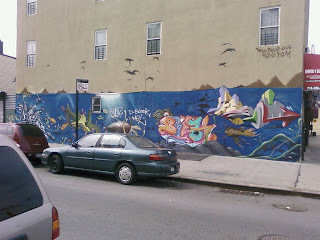 A few miles east, old P.S. 83 is now the Bethel Tabernacle A.M.E. Church (though it seems to be falling into disrepair, top photo), with replacement school P.S. 243 sitting next door in its shadow. 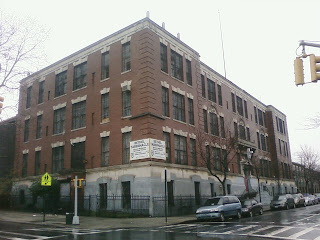 The United Talmudical Academy has reinhabited several schools in South Williamsburg, including old PS 22 and old PS 168 (second and third photos). Both have postwar-era schools either on the same block or less than a quarter mile away. The questions I couldn't answer were how these buildings changed hands and why they were replaced. Did the city sell them outright after building new schools nearby? Was that the plan when the new schools were built, or were the schools intended to serve side-by-side with newer buildings and then shuttered when population plummeted in inner-Brooklyn neighborhoods due to white flight and suburbanization? 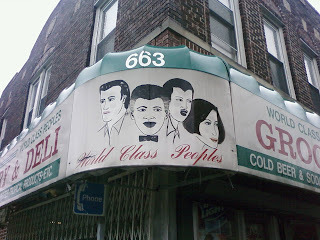 When did the current tenants acquire them, and what's the going rate for an old school? Finally, if they were dropped for reasons other than population decline, what features of these grand old temples of learning rendered them anachronistic or problematic for a new generation of Brooklyn students? There's probably a book (or at least a master's thesis) available on this somewhere, but I haven't found it yet. Yesterday's review of the new spot at Washington and Park, Washington Commons, was incomplete. A buddy informed me today that the bar sports a huge outdoor space, which can only be considered good news this time of year (today was a good one for outdoor drinking). He told me it was a little heavy on the concrete, but that's nothing some planters can't fix. A new beer garden coupled with a solid location? I can see this place doing very well this summer. Apologies for treading on the Daily Heights' turf, but I couldn't resist mentioning a thoroughly enjoyable bar that's just opened tonight on Washington and Park. The place was so new that you could smell the fresh paint and sheetrock, and the bartender told me they'd "opened an hour ago" at 10:50 pm. There's a big three-sided bar up front and a few tables to the side, with more seating up some stairs in the back. They don't have a sign up yet, but the place will be called "Washington Commons" as soon as they do. The new joint offers a wide selection of beers on tap, with an emphasis on the Belgian and Belgian-inspired varieties, including the world's silliest beer, Kwak (note the serving glass, which gives the impression that your draught might turn you into Mr. Hyde). The beers were $5, which may be an opening-night special, but seemed reasonable enough for the fancy stuff they were serving. I don't know if they intend to keep it, but the minimalist, unfinished decor works nicely for the space. In sum, go grab a beer at Washington Commons this weekend. 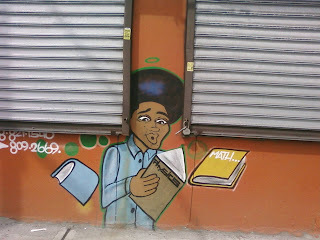 I walked less than half a mile on a mere three streets (Morgan, Wilson and Noll) through East Williamsburg/Bushwick last week, and saw four extremely detailed and well-executed murals along the way. It's never boring to live in Brooklyn. We've got a CSA, and now we're getting a flea market, thanks to the people who run Bristen's Eatery. According to this sign, as well as the two-week old posting on Brooklynian, the market will run from May 2nd through September 26th, and the organizers are looking for vendors to participate. Based entirely on conjecture, I assume the market will be held in the lot where the sign now hangs at Sterling and Franklin, currently home to a well-preserved GMC 3100. 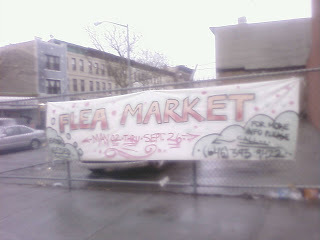 For more information, or to get involved as a vendor, email bristenseatery@yahoo.com or call 646.393.9422.